This guide isn't about the sewing bits. I touch on that in other places. Or I will, once I sit down and finish more posts! This guide is for you if someone else is sewing your Jedi soft parts, or if you've already got those figured out! There are TONS of resources on the Rebel Legion forums, especially the Knights of the Jedi Order forum. First, start with the CRL guidelines. Okay, so THIS is why you want to be a Jedi! I know a lot of advanced Jedi who swear by The Custom Saber Shop. Eventually, I imagine I'll get to that point! I went with a budget build, so we have light, but no sound. I couldn't quite justify the additional price for sound, which can almost double the price for some models, as Rebel Legion troops are often loud, and conventions are almost universally loud, and plus, as my husband remarked, we can just make our own lightsaber noises! At Ultrasabers, this is the "stunt" version. I have the Apprentice V4 , which I picked because it reminded me of the flashlight I pretended was a lightsaber when I was a kid. I'll walk you through the options I'm familiar with. If you're not ready to commit to a color, you can select "Adegan Silver," and can get it with color disks. There are tons of different colors, which is awesome, but your blade color won't be as vivid as it would have been as a dedicated color. The CRL states that acceptable Jedi blade colors are: "blue, green, yellow, orange, white and violet. No red, pink or black blades." I have the basic AA battery model. My lightsaber has a 32" blade, which is large than the 24" that comes with Initiate sabers. My husband has the Bellicose model, which comes with the 36" blade standard. I like the 32" because I can still hang it from my belt, and it can fit in my biggest suitcase when separated from the hilt. I'll need to get a 32" blade for my husband for DragonCon! There are a number of style options you can pick. The next option I would suggest taking is the Blade Retention Screw Wrench. For $1, its worth having a tool dedicated to removing your blade! I suggest keeping it in your Jedi pouches! Blade plugs are neat for when you're carrying your hilt without the blade, but we haven't used ours yet. Worth getting, but something you can eliminate if you're on a budget. NOW we're on to something you need -- the Covertec clip! This is how you'll hang your lightsaber on your belt, and is necessary for Rebel Legion approval, unless you have an original trilogy saber that hangs from a clip. You can see mine on the far left of my belt below. Order the clip from Ultrasabers (currently $10) and then add the Covertec wheel (currently $14 with installation). Those are the key options you'll need. If you plan to fly with your Jedi, I do suggest ordering a blade that will fit in your luggage at this point, as you'll save on shipping. I need to get my husband a 32" blade, or I'll risk him buying some fancy fishing rod case and then wanting to actually use it to fly all over creation to fish. . .
BE AWARE, however, that I've heard stories about lightsabers being flagged by TSA for additional inspection (understandable, considering it is a metal tube of electronics), so you'll likely want to pack the hilt somewhere it can be easily examined. ***I bought our lightsabers long before I signed up to be an Ultrasabers affiliate, and actually wrote this text before I knew about the affiliate program, so these opinions are entirely my own and not influence by any financial irregularities/bribery / trade union /separatists. There's another style, which seems to be more popular in the Rebel Legion, which is the Prequel Trilogy style. The OT style is easier to make, so that made my decision extra easy! The belt and boot colors DO need to match, so if you already have your boots, you'll need to coordinate with them. I decided to be strategic, and use my Imperial Officer boots for my Jedi, as that would allow me to pack one pair of boots for two costumes when traveling! If you think you'll want to put together an Imperial Officer, or a Han Solo, or one of the many other costumes that require black Equestrian boots, and you don't already have boots that you can use, I HIGHLY recommend that you spend a bit more and get multi-purpose boots! Your cheapest option, for men's sizes, would be PVC riding boots. They'll run you about $60 or $70. Or. . . I've heard good things about Magnoli Clothiers' Falcon Boots. Standard sizes are currently about $300. Custom boots go for $750 . . . but HOW BEAUTIFUL ARE THEY???? I'm optimistic about these boots for men, available on Amazon. (***August 2018 update - I ordered a pair for my husband's Han Solo and I can now HIGHLY recommend them! ***) They have no zipper, so they may be challenging for some to put on. The version with a zipper has the zipper in the back, which doesn't work with the CRL. Here's the women's version. Perhaps, ask your local cobbler if a hidden zipper could be added to the inner calf. (Zippers don't work for level 3 Imperial Officer approval, however.) I've also heard of people having luck with http://www.sovietboots.com/ . I had ordered a pair of officer boots from http://www.imperialboots.com/product/officer-boots/ for my husband, but that batch had some quality control issues. Their customer service was fantastic, however, so while that particular pair didn't meet expectations, I'm still recommend the company. If you need a zipper, they have them with a hidden zipper on the inside. I also want to add that I love my stormtrooper boots from them! Just need to finish my armor so I can actually wear them. . . . I found my boots on ebay for $50! For ladies' sizes, I'd suggest searching around for a deal. Brown or Black Boots – Leather or leather-like (no rubber boots). a. Mid-calf, but not above the knee. (motorcycle boots, or “engineer” boots, ~ 14″) Extensions like seen in the movie are allowed). b. No visible laces or outside zippers. When necessary, inside zippers are permitted. c. Straps & shin-spats are allowed but not required (though can be used to cover laces and zippers). d. Boots and belts should match (be of a complimentary color), i.e., black and black or brown and brown. No black/brown combinations. 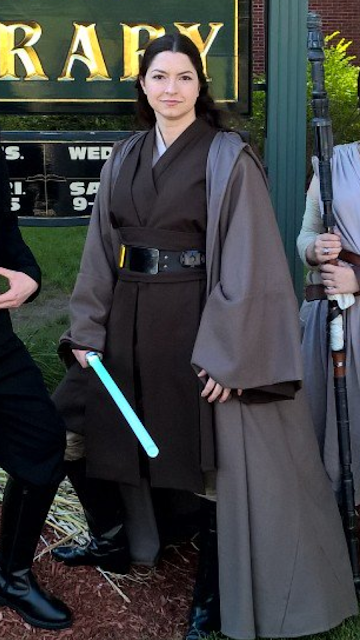 e. Buckles are permitted, but should complement the boot and not detract from the overall look of the Jedi costume. f. Low-heeled 1 – 1 1/2 inches maximum. Spike heels are not permitted. g. Mini-Chaps (not above the knee) are allowed. Knee-high, black, lace-less, smooth non-textured, leather or leather-like material. PVC or synthetic material is allowed as long as it gives the appearance of leather. There are no stretch panels, buckles, snap tabs, or decoration. If zippers are present, they are hidden on the inner part of the boot shaft. Not visible from the front, side or back. The top of the boots may be flat or Spanish Style, but not Cowboy or Super Hero (pointed at the front) style. Boots do not have a zipper. Boots are made of leather. Exact replicas of English riding (dress) boots or Equestrian boots. For approval, you need at least three of the four required extras: Inner tunic, Jedi Pouches, Food pellets (at least 4), or a Robe/Cloak. For this, you might want to consider the weather. A full inner tunic and an outer cloak will add to the heat, but will also keep you warmer in cold weather! The inner tunic can actually be a "dickie," so it doesn't need to add a lot of warmth. The food pellets are supposedly easy to make, but they're even easier to buy! I got a set of 8. Four went to my husband's Jedi, and four to mine! You can make your own pouches, but you can also buy them. If you do buy them, make sure what you pick meets the CRL!